We’re in the final stretch, folks. With Christmas just a few days away, Pinterest and Google searches regarding anything holiday related are completely overwhelming. Right? Right. Every 2 seconds a new “Must Make” list comes out pertaining to holiday goodies. It’s too much (and this is coming from someone who ADORES the holiday season and anything and everything related to it). Well, I’m here to simplify things for you. Because really, the only answer to your “what should I make?” questions is always this: MARGARITAS. Forever and ever. Now, I know what you might be thinking: margaritas are for summer. WRONG! Margaritas are for all seasons. Heck, one of the yummiest variations was one I made with mulled apple cider a couple months ago. Freaking delicious! Margaritas are for all year. I think they’re perfect for entertaining, too, because nothing screams “PARTY!” like tequila. It’s also really easy to make margaritas in bulk for a crowd, which is an added bonus. 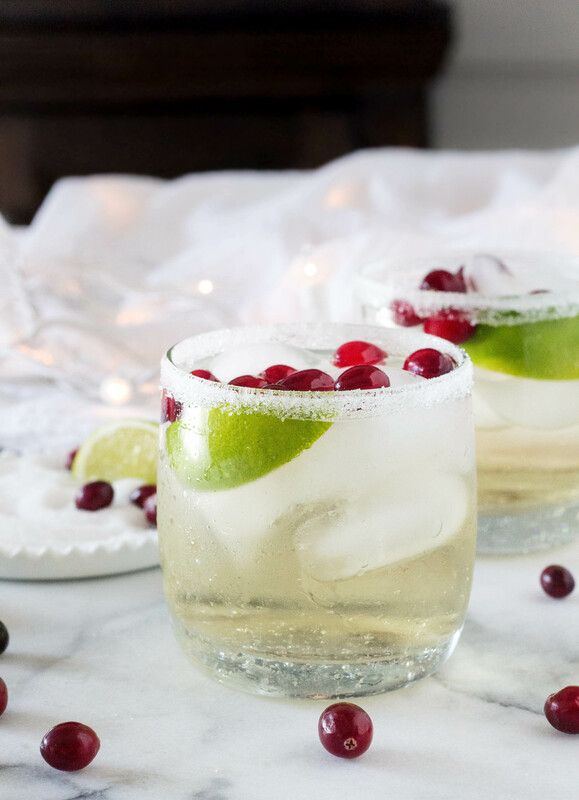 So, today, I’m sharing a “must make” Merry Christmas margarita! It’s a straightforward and easy (!!!!) recipe that requires zero cooking. ZERO. As in, no simple syrup is needed for this recipe. Awesome, right? The reason for that is the white cranberry juice. It’s plenty sweet for my tastes, but if you want to take a little edge off your margarita mix, just add in a drizzle of agave nectar. It’s neutral in taste and plenty sweet. It’s my newest go-to ingredient for quick-and-dirty margaritas. Or, if you’re feeling up to it: make your own sweet-and-sour mix. That’s definitely a fun touch for the holidays. 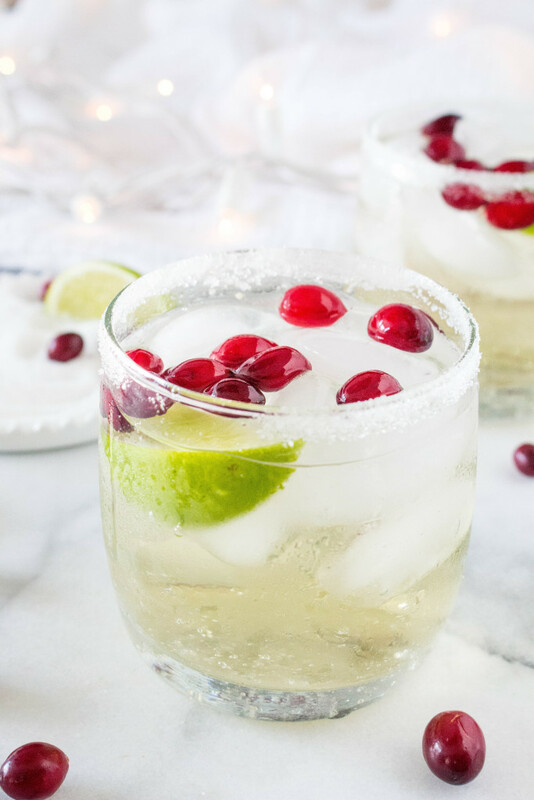 Not only is this cocktail delicious, but it’s also so pretty and festive! If you want to go all out, you could even smash in some mint or sage leaves for more color. It will definitely give it a different flavor, but I’m positive it will still taste great. Plus! The more green, the more festive! 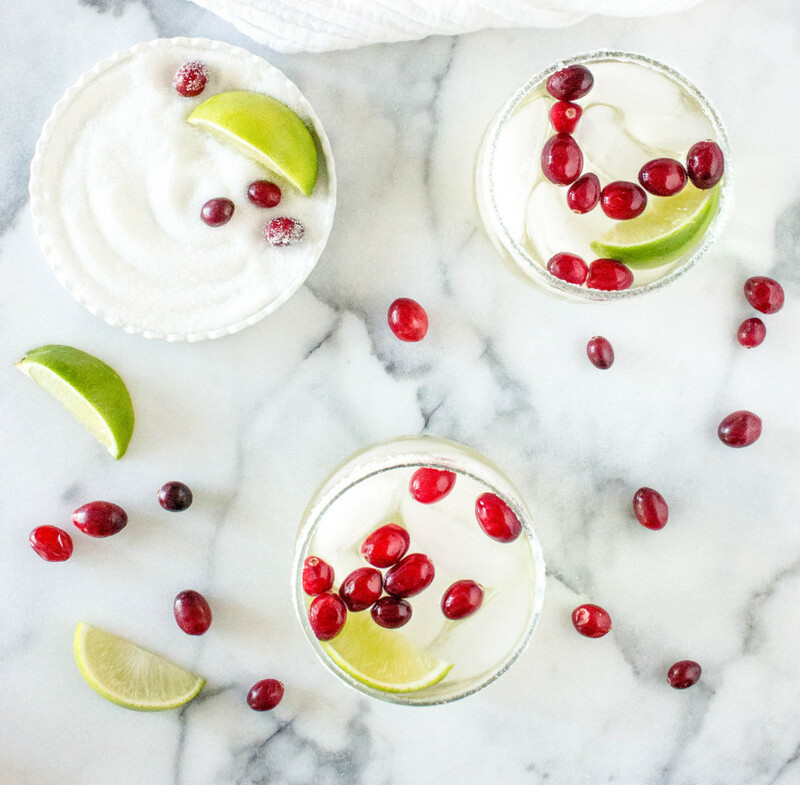 Speaking of festive, aren’t floating cranberries the cutest darn garnishes?! I think so. White cranberry juice is a Christmas weakness for me. I like it so much better than regular cranberry juice because it’s not as…parching. Do you know what I mean? Cranberry juice often dries out my mouth and just makes me more thirsty! Tell me it’s not just me. I want something to QUENCH my thirst, not make it worse…and so, I often turn to white cranberry for the base of my holiday cocktails (see here and here for two AWESOME white cran recipes…SUCH crowd pleasers). I also find that many people prefer it’s slightly sweeter taste over regular cranberry juice. 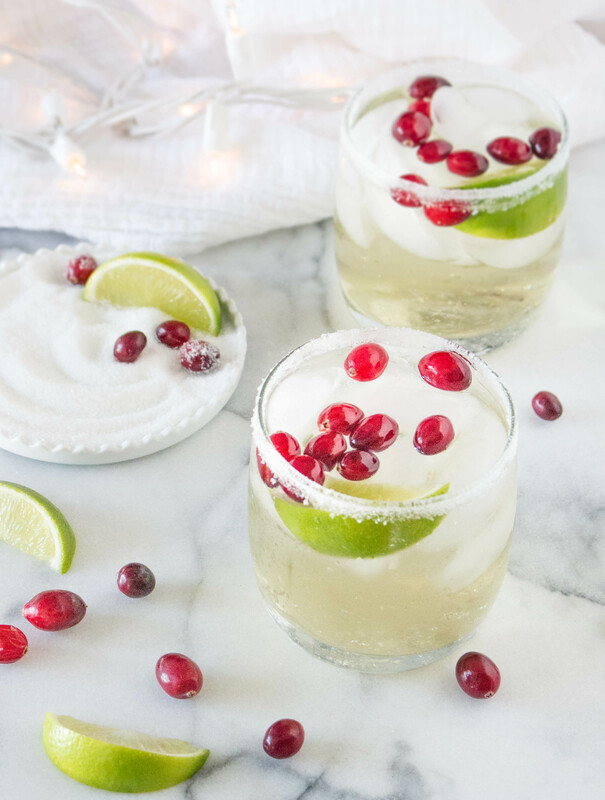 Given my affinity for white cran and my straight-up obsession with margaritas of all kinds, this recipe should be no surprise. It just WORKS. They’re fun to make AND drink, they taste great, and people get all excited with the floating cranberries. It’s such an easy but seemingly impressive touch. Plus! TEQUILA! Which means…PARTAAY! 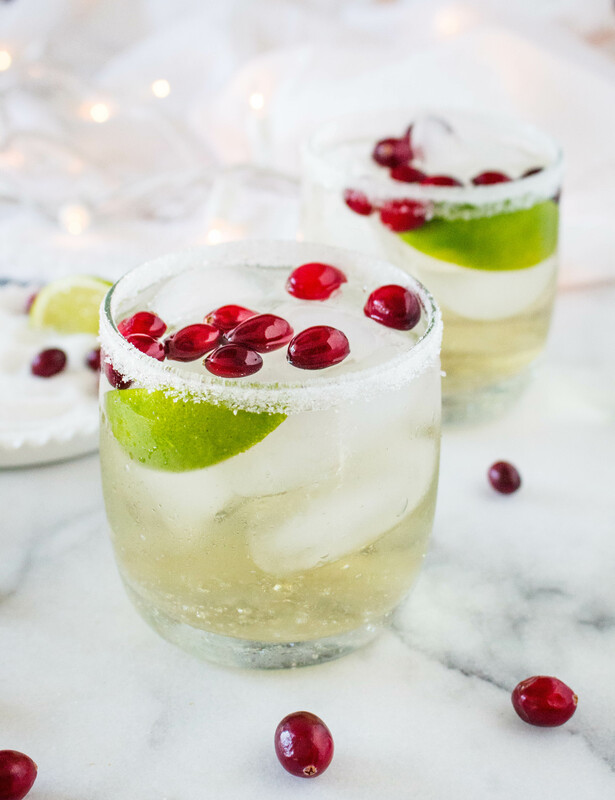 So, Merry Margarita-mas to you and yours! Oh yes, this is something I can definitely get behind. To a shaker filled with ice, add the white cranberry juice, lime juice, orange liqueur, and tequila. Shake vigorously for 20-30 seconds. Sample the mixture for sweetness, and if it is too tart, add the agave nectar. Shake again for a few more seconds. To rim the glasses, rub a lime wedge around the rims and dip in a mixture of equal parts fine salt and sugar. Fill the glasses with ice. 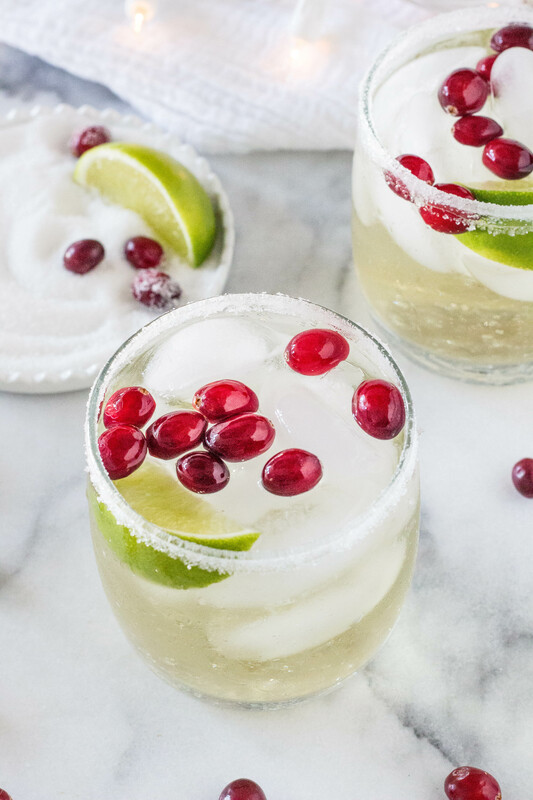 Pour the margarita mixture into the prepared glasses and garnish with lime wedges and cranberries. Serve immediately.